Last night, LEGO brand stores in the U.S. held an adult build event to celebrate Valentine's Day. Thankfully there was no advertising associated with the event around "finding your missing piece". Adults could sign up for the event starting on February 1 at any brand store. I'm not sure how popular this event was. I signed up for one store and ended up not being able to attend at that location; but was able to sign up at another store the day of the build. As far as I know, publicity associated with this event was just on the calendar; I don't remember seeing this mentioned on any emails. Let's take a closer look after the break. Upon arrival at the store, the staff had helpfully provided cups of the bricks required for the build. There were copies of the instructions available but we weren't allowed to take those home. I took a couple of quick pictures of the instructions which you can view here and here. 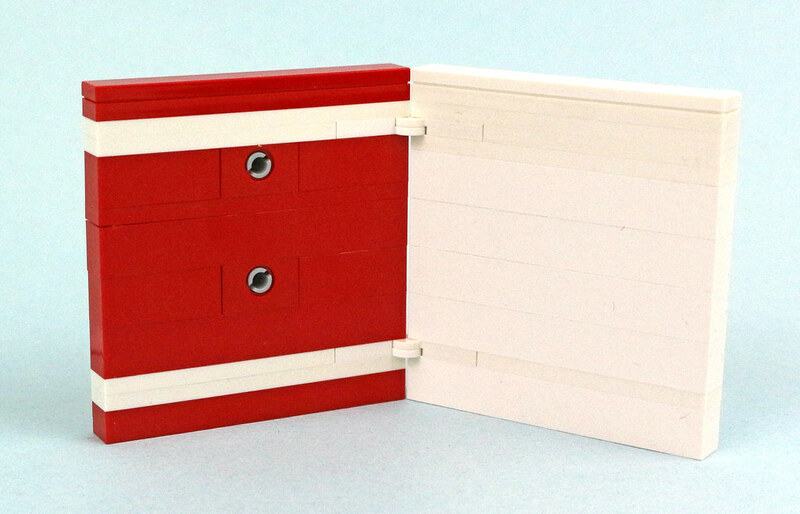 Not surprisingly the build features red and white bricks and is a very straightforward build. 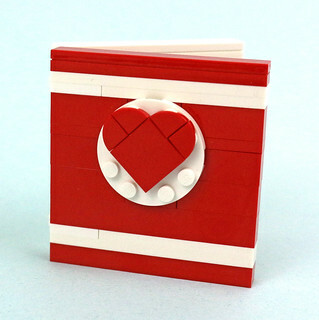 I was pleased to see the use of red quarter circle pieces in order to fill out the heart. Opening the card shows that it's pretty unremarkable, with the back of the card consisting solely of white bricks and plates. Two hinged plates keep the card together. For those who couldn't make it to a store, most of the pieces should be readily available. However, the plain back of the card is there for a purpose: the ability to customize your card using any of the provided stickers. It's the first time that I've seen stickers designed to cover more than one brick. I find the stickers quite amusing. They reminded me a lot of the LEGO related chat up line contest we had last year. The white space is actually a blank sticker to allow you to write your own chat up line! A nice little giveaway for those who had chance to get it. I wish that LEGO would offer these events a little more often than once a year. I like the step on a brick sticker. Classic. That's awesome. I wish I still lived near a LEGO Store as the person I'm kind of dating I got them into (super expensive) LEGO. This would have been fun. We had a horrible storm here and couldn’t go. I was so bummed. And yup, yet another US exclusive. If you've never seen stickers designed to cover more than one brick go look at 6335 Indy Transport. That one has a single sticker in around 10 pieces! This is a nice little freebie, I love the stickers! 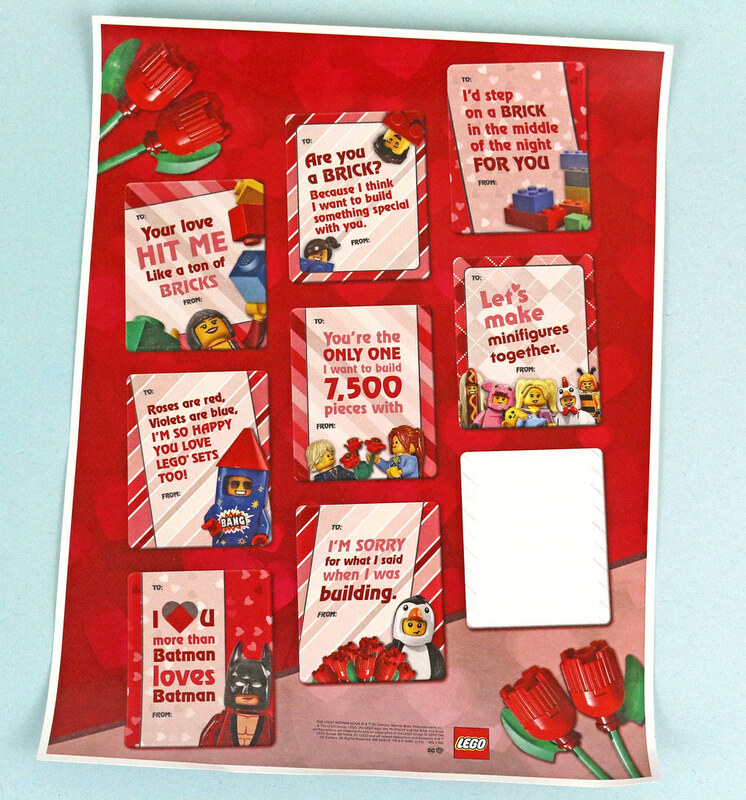 It's almost like an update to a valentines day polybag 40015 from years ago . Sadly I gave away my copy of it. My favorite sticker is the middle one in the left column. The R2/C-3po hieroglyph easter egg sticker from the Indiana Jones 7621 set also covers two 2x2 tiles- it's on the front of the snake basket. I seem to remember that sort of thing being uncommon but not unheard of in other older sets too (like the 6335 mentioned above). I'm glad LEGO has moved away from doing that in recent years, though. 6375-2: Exxon Gas Station (which I have) has multiple instances of stickers used on multiple bricks together. These include the Exxon sign and the gas pumps. "I'm sorry for what I said when I was building"
That might be the best one of the bunch in my opinion. It's definitely one I'd have to use if I was in a relationship. That's a little, suggestive, right? Cute, quaint, but odd. I wonder if LEGO will keep doing promotions like this for other holidays? I suppose Valentines is the only one you can really get "romantic" with, but most holiday promotions seem to just be builds with no interaction with other builders. Surely, other AFOLs on here are old enough to have experienced STAMPs (STicker Across Multiple Pieces)? The ones I remember from childhood are 6683-1 Hamburger stand and 6379-1 Riding stable. ^Yes, quite true. I was OCD enough to leave those parts intact. In fact, they still are with the stickers 75% worn off... I'm very glad they don't do this anymore. In this particular Valentine set you'd hope it's special enough that people would keep it intact though. This was probably their romantic thinking. How was this advertised? I didn't know anything about it. Me and my GF are huge legos peeps, this would've been cool. @Alatariel: When I was a kid I had a lot of sets with STAMPs (Pizza to Go, Sidewalk Cafe, Shuttle Launch Pad, Gas Stop Shop, Sheriff's Lock-Up, Gold City Junction, Fort Legoredo, etc). Typically my dad would then use a hobby knife so I could separate the parts again. In general I'm really glad that STAMPs are mostly a thing of the past. I can forgive them for something like this that isn't necessarily expected to be used as a typical "building set" so much as a more permanent desk accessory or keepsake, but I also think it could have just as easily been designed just a little differently to have the same colors and patterns but also, say, a 1x5x6 panel with stickers designed to fit on that piece alone. Anyway, what a cute and romantic little build! They made you find your own pieces? Lame. At my store we sort them out manually for every guest so they don’t have to go digging for them. My store had the pieces out for you to pick as well, each cup had a sticky note saying how many you needed though. matty327, it was pretty much the only thing left on those now completely useless store calendars. I asked someone once, let's make minifigures together! The judge says I'm not allowed to do that anymore. I’m only aware of a Nexo knights mini-Fortrex building event in Sweden’s brand store years ago that is comparable to this. Would be nice with more events. Wish the closest Lego store wasn't 2.5 hours away. But the wife gave a hearty laugh to "Let's make minifigures together". I didn't think to sign up when I was there last week. I wish I had just for the red and white bricks that could be used for other things. When I was a kid, I had the Legoland Fire Stations 6382 and 6382, the Airport 6392, Cargo Center 6391, and Shell Service Station 6378. They all used stickers across multiple bricks and I never took those bricks apart. @MeganL Any chance you could scan the sticker sheet? Also, does the Brickset database have this item? @Countess Brickula: indeed. I remember most of the sets I got as a kid had stickers across multiple parts. Even today I still have these pieces and the affixed stickers assembled in my parts bin. I tend to keep them together with all the large printed pieces. Hi Megan - Thanks for the review. My wife and I was able to attend this Valentine's Day minibuild at our local Lego store. As you said, it is a straightforward build but still fun regardless since you are doing it with your significant other. This is one of the few Lego minibuilds for adults. At our location, they let us keep the instructions. I've scanned them so can provide them to whoever wants them or can send them to you so you can post it on the site. The store in Nashville, Tennessee not only let us take the instructions home, but they had separate containers for everyone with the pieces counted out. Best of all, the employees had set out a table with a tablecloth and made a LEGO wine bottle (using the bottle from the Ideas ship) and candleholder, with a light brick for the flame. The staff at that store are always super nice and helpful.